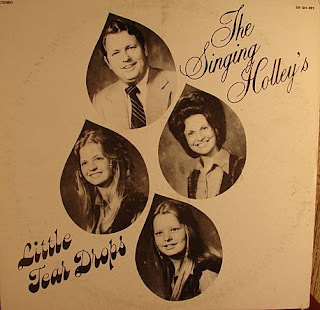 Little Tear Drops (Singing Holleys SR-SH-001) 1974? I found this old record and the cover was damaged. Your blog helped me get most of the information that was damaged. Can you tell me what the dogs name is under the picture? The Holleys didn’t live in west Tennessee in the 80s plus the song (last mile together) was written from margaret to clint on there anniversary. Not Bro. Mike and Jewel. The dogs name was ( D O G ) and to the other guy asking for sheet music I will see if I can get some info about that..
Hello, my name is Paul. I have a copy of Little Tear Drops. Is it possible to get any of the sheet music? In particular, I am interested in the song Show me the Way to My Father’s House. I will try to record it from turntable to CD. If you know if it is available any way other than on LP, I would appreciate it. The Holleys spent a couple of months at Powell”s Grove Church in Jayess, MS in late 1981 when I was 14. Bro. Mike Newsom was the pastor of the First Pentecostal Church in Batesville. Clint Holley wrote most of the songs-my mother also had this record. By the way, Clint, Marble, and Candy are all deceased-only Margaret(Toedy) is still living and was married to late Congressman Ken Gray. Also in the early 80s Marble and her husband were music directors at Bro. Mike’s church in Batesville, MS. Their choir made an album and my mother had it as well as other Holley music. Candy was married at one time to one of the McKeithen’s of the famed Singing Hemphills. I grew up listening to their two albums. If anyone is able to put them on cd, I’d love to purchase. how do I get these songs. The group visited my church in mesa,arizona. The Holly family used to visit the church where I was raised in Knoxville Tennessee and I still find myself singing these songs to myself from time to time. She had such a sweet voice. I loved all their songs, but Toedey’s best one was probably “My Mama’s Baptist Bible”. I sure do miss the Holly family. I’d love to hear their music again, but can’t find it anywhere. I miss The Holley Family’s songs. Is there any way to get copies of their recordings ? ” I see a ship in the distance, could this be my ship for home ? Could it be a few more trials & valleys I’ll have to bear ? Oh, Lord, help me to hold on just a few more days. “On your way back, for your children. Only a few days to wait. On your way back, for your bride. Were you able to put the LP on a CD ? I’d love to hear their music again ! Thank you for the information. I didn’t know most of the family had passed. I’m going to attempt to write to Margaret (Toedy). Bless her heart, she has been through so very much. Also, I didn’t know about the McKeithen / Hemphill connection. I loved both of those groups, too. Sad to hear of LaBreeska Hemphill’s home going 2 years ago. what a tragic loss ! 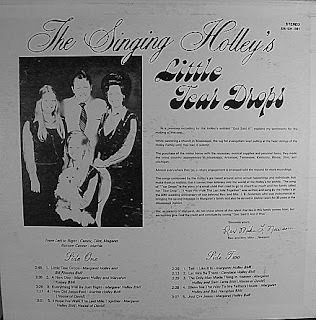 I’d love to somehow get copies of The Holleys’ CDs ! Probably Clint Holley’s best vocal ! Why have my comments been deleted ?
? Who’s moderating this ? Why were my comments deleted ??? I can see it so clear, I can find myself way from here. I finally reached Toedy by mail, and she was so very kind to write back to me. She explained all that had happened to the Holleys, and how the Lord has now sent her Bro. Duke. She is smiling again, after having been through so much. It’s nice hearing the Holleys music again. A lot of their music is available for purchase, via downloads, on this site. and that “everything IS just right in Heaven” for him, Marble and Candy. We still have Sis. Toedy , so let’s support her and Bro. Duke’s ministry. God has a reason for everything, and we are each and every one right in the palm of His hand ! How can I order music from this family. I have the tape from about 30 years ago but it’s definitely not professional and I love their music. Please have Margaret get in touch with me on facebook or e-mail me. Please. We lost touch with them when they moved from Grenada, Miss and I would love to talk with her.